As a crossfuncional process in the organization, effective management of corporate social responsibility requires a definition of strategies, programs and an action plan that structures this process from its initiation to the measurement of end effects. Academic literature on the topic of corporate social responsibility is mainly focused on the exploration of the business case for the concept, i.e., the determination of effects of social responsibility on individual aspects of the business. Scientific research so far has shown not to have been committed to formalizing management concept in this domain to a satisfactory extent; it is for this reason that this paper attempts to present one model for managing corporate social responsibility. The model represents a contribution to the theory and business practice of corporate social responsibility, as it offers a strategic framework for systematic planning, implementation and evaluation of socially responsible activities and programs. Issue number81, of journal for theory and practice "Management", is published and it can be downloaded from 'Review of issues' section. It has been published only in English version. Issue number 80, of journal for theory and practice "Management", is published and it can be downloaded from 'Review of issues' section. Issue number 79, of journal for theory and practice "Management", is published. Articles from this issue can be downloaded from 'Review of issues' section. 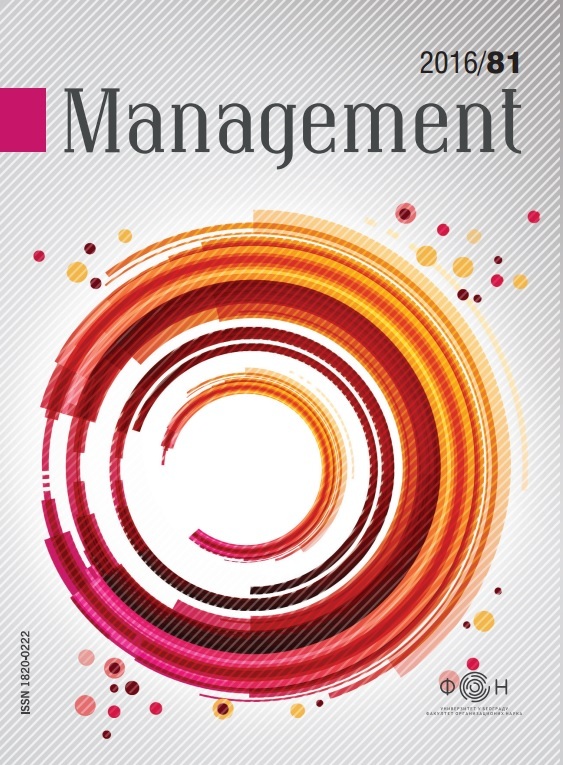 Issue number 78, of journal for theory and practice "Management", is published. Articles from this issue can be downloaded from 'Review of issues' section. Issue number 77, of journal for theory and practice "Management", is published. Articles from this issue can be downloaded from 'Review of issues' section.